Gunboats were usually slow, small patrol ships with relatively light guns (6” [152mm] or less) and little or no armor. They were used primarily to “show the flag” in distant and isolated areas. The United States made little use of gunboats other than the river gunboats of the Yangtze River Patrol. These were recalled to Manila just before war broke out and saw local service there, in the Netherlands East Indies, and in Australia. 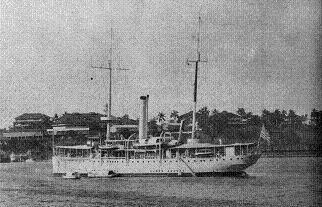 The Japanese converted a large number of merchant vessels to gunboats to patrol their maritime empire. These were sometimes quite large, blurring the distinction with auxiliary cruisers, but most were smaller. The smallest ("armored boats") were suitable for patrolling the smaller rivers and canals of China.